With our hot air balloon elopement package, the two of you will take to the skies in a hot air balloon for your special marriage ceremony. The all-inclusive package includes two nights in a deluxe romantic room with a private bath room, a fireplace and a queen-sized bed. It includes full breakfast each morning, the marriage ceremony with the pilot officiating, champagne and two souvenir flutes to keep as a remembrance of your balloon flight, and a private dinner back at the Governor’s House in Hyde Park with a wedding cake for two. For couples from outside Vermont, we can arrange the paperwork for the Vermont marriage license which costs an additional $45 and you’ll be Up, Up and Away forever with very special memories. 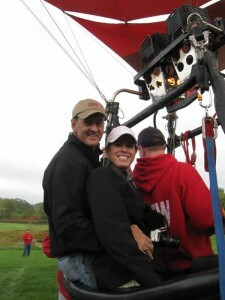 The complete balloon elopement package is $1,275.00 plus tax. Or you can opt for an exclusive private balloon ride with just the two of you or take up to six guests along for the wedding ceremony in the balloon for $2,750 plus $225 per guest. There is a surcharge for certain dates. 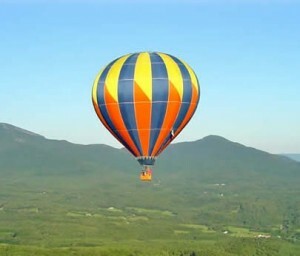 The balloon elopement package is available in all seasons. Since a balloon flight is weather dependent, we always arrange to have a justice of the peace on call to do the ceremony here at the inn if it becomes too windy to fly, although that is rarely necessary. A deposit of $250 plus tax is required to hold your reservation, start the marriage license process, and arrange the balloon flight. Just imagine saying, “I do” as you float through the sky over the beautiful Vermont hills and then returning to a cozy inn for your private dinner.